Boy does time pass and years later meet back up with great college friends. (Michael Jan Denise Carl) Michael and Carl college years were 1966 or there abouts. Jan was his college sweetheart and yes still his sweetheart years later. 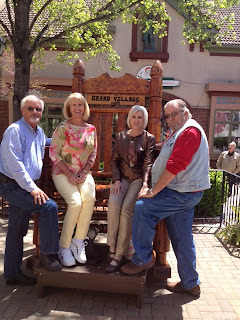 Both retired and in Adel Georgia came to Branson for a visit which we totally enjoyed. There were a few things Michael reminded me of back in those days and Denise had to ask did I attend any classes? Where did the years go? Carl goes for a doctor appointment on a Thursday and complains about his arm hurting. The cat scan showed his bicep tendon barely hanging on by a thread. The following Monday he was in surgery. Recovery should take 12 weeks. They said if they didn't do surgery immediately and his tendon burst, he wouldn't have full use of the arm. 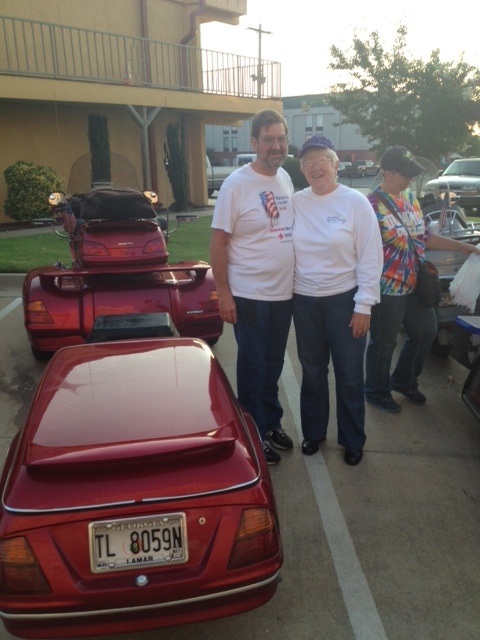 We met my sister Patty, Raleigh, Harold and his daughter in Little Rock after their 7000 mile plus trip. Headed home after 30 days of riding. Guess it was good I had surgery and could not ride the bike cause these people have to be TOUGH. Hate we missed it, cause there is never a dull moment. Well, during the winter of 2012, we sold our condo on wheels. It was bittersweet. We are not traveling as much as we used to and the bus sat at the campground 6 months out of the year. We have been blessed to have enjoyed our unique lifestyle for so many years. We are back to work in Branson, ready for a new season!! Celebrate America at College of the Ozarks - all you can eat barbeque and fireworks. Sherrell was released to start back to work - There is a God!!! I was exhausted working 40 hours! Georgia got her first professional cut. Carl and I were trying to do this ourselves - poor little thing looked so homely. Been VERY busy!! Haven't done too much outside of work. Thank you all for your prayers, I seem to be doing better on the 40 hour work week. Carl is down to 1 day of working ( poor thing). However, he is turning into a great "wife"!! He does everything around the house right now and even has time to have dinner ready when get home.... I could easily get spoiled!!! Thank you honey -- I love you!!! Never knew how hard going back to work 40 hours was gonna be!!! Sherrell is still not back, so, I am working 5 days a week and Carl is working 2. (Something is not quite right with this picture). I am exhausted by the time Friday comes around. I am training the new workers, and re-training the winter workers. Keep me in your prayers -- they are not very happy with me.